Music is one of the most important sacred tools of Afro-Diasporic traditions in the Americas. Brazilian Candomblé, Dominican misterios, and Cuban regla de ocha or santería deploy drums, and musical traditions that have been maintained and transformed by Afro-descendant peoples over five centuries, to invoke sacred forces to their ceremonies. Along with altars that can dazzle with their beautiful simplicity or, at times, ostentatiousness, music allows the divine to co-exist with our humanity. To crown an iyawo or initiate in Cuban santería, Yoruba songs invite the natural forces that rule our universe to come and bless his/her head with their power. Obatalá, the orixa or divinity who watches over all human heads, Ochún, who rules the river and love, or Yemayá, the mother of all and queen of the ocean, respond to the ancestral calling of their children. At a tambor, ornate altars for the orixas are prepared to invite the divinity to dance through the body of the initiate, and share their blessings with members of the community. A cajón, on the other hand, is a celebration of the spirits that watch over each one of us. Three drummers play with wooden boxes, at times, metal spoons and buckets to honor the ancestors of those hosting the event. 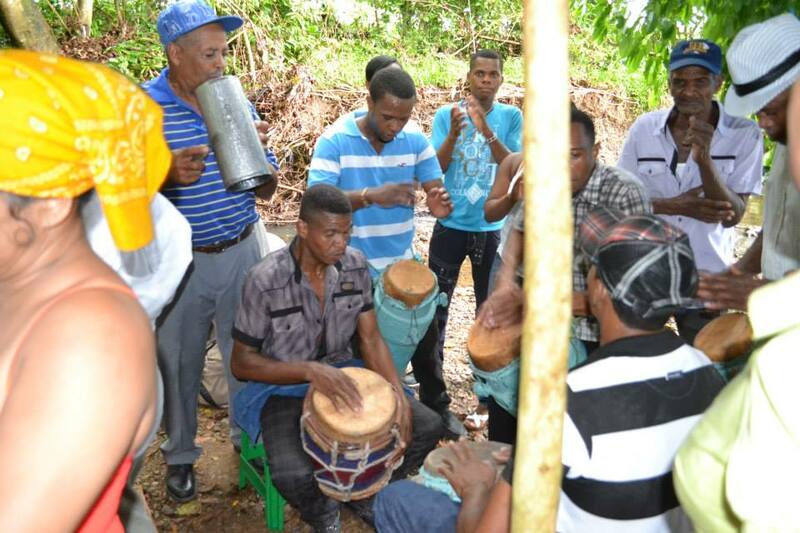 In the Dominican Republic, misterios practitioners also use music to honor the divine entities that accompany them. Anaísa, San Miguel, San Elías, Candelo, all respond to the calling of the palos that are played for them. The palos group El Gran Poder de Dios from San Cristóbal, DR plays here for Anaísa by her home, the river. Anaísa grants them with their wish. She dances for them, and offers honey and prayers for their health and prosperity. Santeros host the feast. Anaísa is Ochún for them. Music brings together two traditions whose roots date back to the slave trade of Yoruba, Congo, and Fon people from Africa. In both regla de ocha and misterios the river brings forth sweetness, love, creation into our lives. Music becomes the medium through which Afro-Diasporic peoples encounter each other at the other side of the Middle Passage. Irmary Reyes-Santos (Alaí) is Assistant Professor of Ethnic Studies at the University of Oregon, and Co-director of Revista Estudios Sociales, in Centro Bonó, Dominican Republic.